Share this product and receive a $13.75 sharing discount. 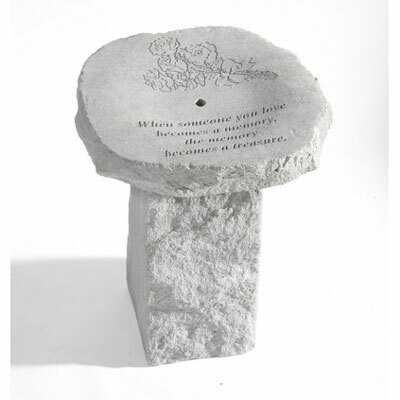 Memorial fountains add a touch of soothing sounds and a tranquil environment to a memorial garden. The cast stone fountains are weatherproof and durable for all seasons. You have two choices... you can purchase this fountain with or without the stand. Ground level fountains are also very popular. 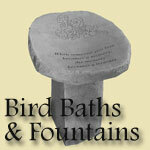 With stand measures 16" x 15" x 21"
Without stand measures 16" x 15" x 4"
All tall fountains are shipped in 2 boxes. Included are the top, base, pump, hoses, 18 x 24 plastic well reservoir, pump housing and instructions. All ground level fountains are shipped in 1 box. Included are the top, pump, hoses, 18 x 24 plastic well reservoir, pump housing and instructions.